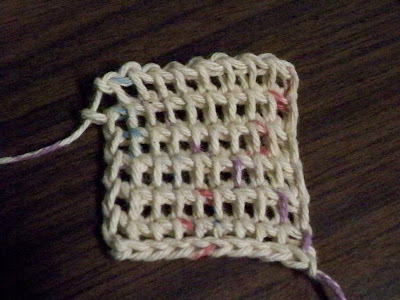 I don't know if this has a name but it's a little variation I came across when 1st trying to learn Tunisian crochet (or the afghan stitch). 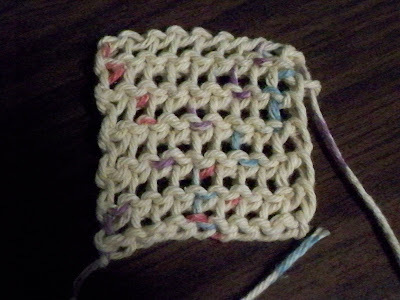 I do like this though because it creates a mesh like fabric that is more airy and great for making things like soap sacks and strips to use for back scrubbers, it's easier to dry than regular Tunisian and has a nice exfoliating effect for the bath and of course isn't as dense in the hand. The main thing is you are working in the back loops for the whole thing, NOT going into the posts/bars. 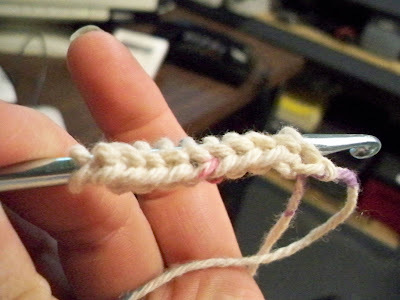 I always start any crochet by crocheting in the back loops. I like to leave the braided edge of the chain untouched, it looks better IMO. So draw up your loops through the loops in the back of your foundation chain. 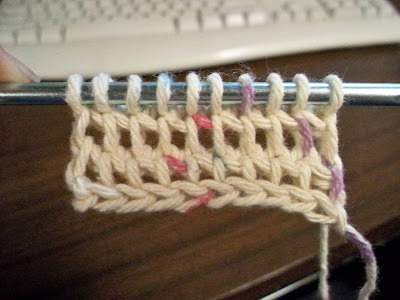 Hook them off just as you would with regular Tunisian crochet drawing through 2 lops on hook. the only thing, when drawing up your loops it is VERY EASY to drop the last stitch so you gotta make sure you don't loose it.